KEITH SASS is a writer and advocate for those kindred souls who are deaf, autistic, and/or battling idiopathic pulmonary arterial hypertension (IPAH). He was raised in the heart of Minnesota. Too Bad is his first book. The Author: Keith Sass, MN, Easter 2007. Keith sees "Too Bad" for the first time! MN, Christmas 2007. Thank you for visiting Zabel Books. 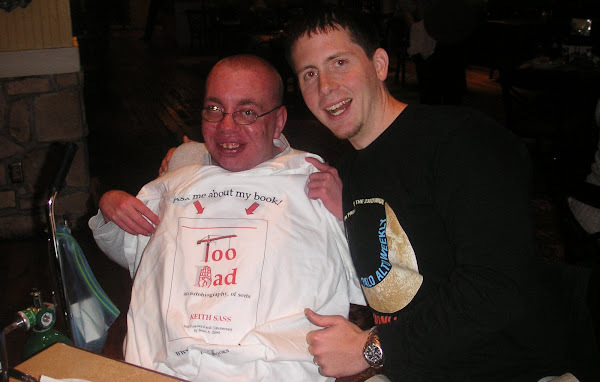 We are proud to launch our new publishing company with a fascinating book by first time author Keith Sass titled, Too Bad, an autobiography, of sorts. Keith is a young man of uncommon good nature and humor; of curious quirks and esoteric obsessions; of courage; of passion; of vitality and genuineness. Too Bad is a story that offers insight into a world without sound; a world seen through the eyes of autism; a world where every breath is a blessing and a battle won against pulmonary hypertension. Keith’s world is immediate, emotion-filled, and without pretense or pretension. Unlike most of us, there is no filter between his mind and what he communicates to the world. Keith writes as he signs, thus he has little regard for articles, tenses, or matching singular nouns with appropriate verbs. This writing style is rudimentary yet effective and visceral; some of the sections read more like poetry than narration. His book provides a reminder to cherish family, friends, and happiness; to rise up and right what is wrong; to have opinions and ask questions; and to embrace life, every moment. Zabel Books is currently accepting manuscripts for publication. If you have an interesting story to tell, please contact us. 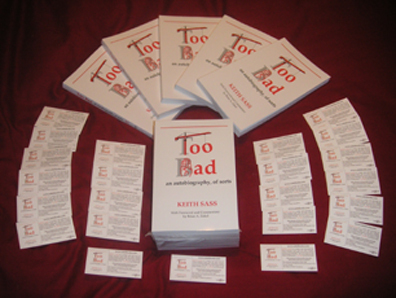 We have sold our 100th copy of Too Bad, and have raised $240.00 to support Keith's specified charitable and research organizations. Thank you to everyone who has purchased a book! CA Residents: Additional $1.65 per book for sales tax (8.25%). We ship via First Class US Postal Service. Please allow 3-10 business days for shipping time. For orders outside continental US, buyers will be required to pay additional shipping costs before the order is processed. To purchase, please click button below or paypal to zabelbooks@gmail.com. Click to watch Keith sign a passage from his autobiography Too Bad. Author Keith Sass and publisher Brian Zabel.